“It’s product that drives sales,” the novice might even say. To that novice in the retail industry, shelves are simply shelves. Retail POP Shelving is much more. Of course the seasoned retailer knows that your retail sales are driven by impulse. Impulse purchases account for a staggering 70% of retail purchases. Marketing studies come back again and again to highlight this fact. This somewhat fascinating statistic allows Avante to deliver such remarkable results to our clients. 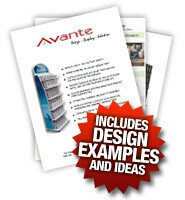 Avante is your source for all your retail POP shelving needs. Featuring slatwall (slotwall), pegboard, display cases, clothing racks, shelving, modular displays, acrylic displays, kiosks and interactive displays. Whatever the display, Avante’s track record of design and production performance will translate into potentially skyrocketing growth. We’ve seen again and again how incremental moves in your display’s conversion rate can translate into remarkable sales growth. Our understanding of retail POP shelving trends, as well as industry knowledge gives us conceptual and design insight your competitors simply lack. 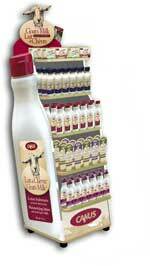 When we create retail POP shelving for you, we create a functioning member of your sales force. And for many companies we create the leading member of their sales force! What Sets Avante Retail POP Shelving Displays Apart? Of course there are a number of reasons why Avante holds the spot as the 1st name in retail POP shelving. Be it our industry leading design team, our commitment to deadlines, or even our reduced costs due to top to bottom manufacturing done on site. Each of these points are valid, and we’re proud to have the chance to live up to these high standards every work day of the year. Above all else, above all the compliments and praise we receive, it’s performance that keeps clients coming back.